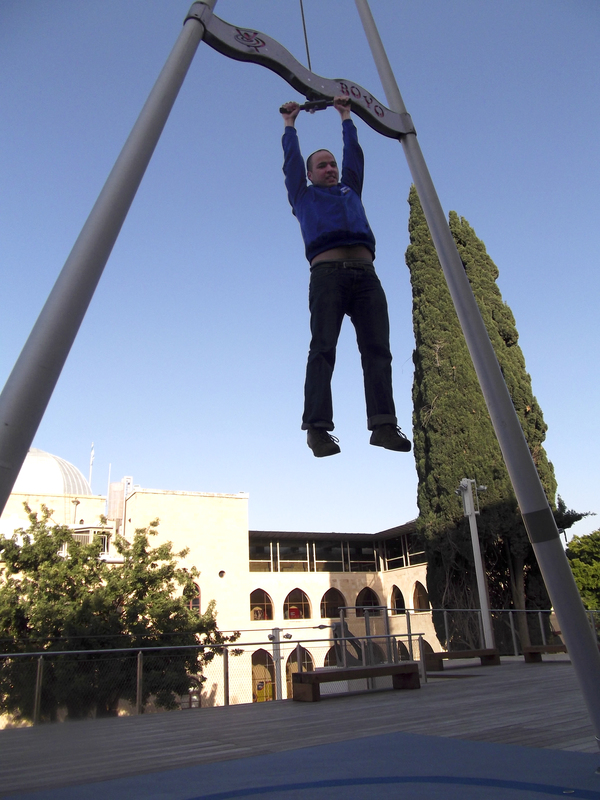 On Monday I went, once again, to Haifa for my Tourist Israel gig. 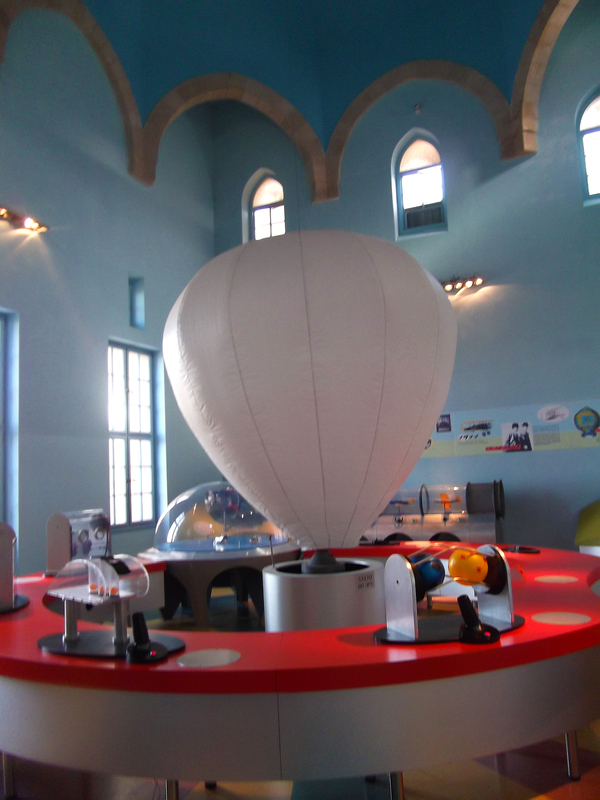 I had two big destinations, the Bahai Gardens and Madatech National Science, Technology and Space Museum. I had to drop off a letter at the City Museum so I made my way towards the gardens going up the German Colony. 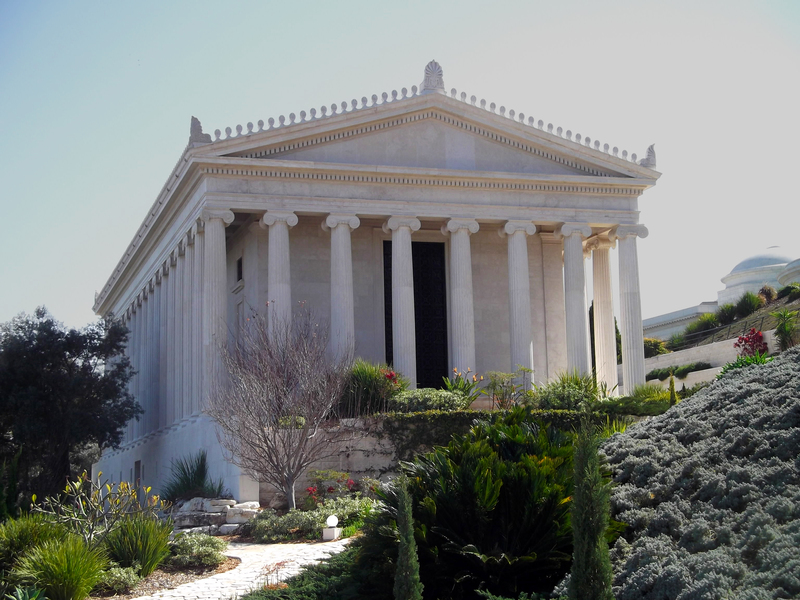 I feel like I know that particular area of Haifa better now that I may never get lost there again – getting lost can have its upside… Anyhow, I found a hapless pilgrim of the Bahai faith and mercilessly interrogated him on the bus routes to the main gate where the Bahai Gardens’ official tours are given. He gave me what I needed and I released him. I waited at the bus stop for what seemed to be an eternity, constantly checking the time because the last tour is at 12 o’clock noon and it was already 11 something. After the picture taking and the gazing-out-at-the-view-whilst-chatting, we headed over to the tour group gathering area and were signed up and checked for weaponry. I was included in the young lady’s party so the guides think I am from Brazil and the couple thinks I am an undercover journalist – whatever! We started the copious walking that is the tour while stopping every once in a while to listen to the guide tell us about the Bahais and the gardens that was built on the land bought by the early Bahai followers. Today there is an amazing 7 million Bahais and they aren’t even allowed to live in Israel, their holiest place on Earth. The good thing about the Bahai is that they are respectful of the wishes of Israel, knowing that Israel doesn’t allow missionaries and thereby forbidding it amongst themselves. That’s a kind gesture in the world we live in today. Anyway, on the tour we passed by the large and impressive structure that is the Bahai Archives Library, I was wondering what these buildings were when looking down at them from the Louis Promenade – now, thanks to the tour guide, I know. After the 45 minute walking tour there was a 20 minute video offered but I declined. I had to leave my new friends behind as they stayed for the video. I then exited the gardens, following the guards directions, boarded a bus and got off near my next destination: the Madatech National Science, Technology and Space Museum. The Dark Room was also of particular interest to me because I found the phosphorescent wall and the plasma ball to be exquisitely entertaining. And of course, who can resist the mirrors in the Mirrors Hall? After some two hours spent inside I found out that there was an outdoor area as well. I had not been mentally prepared for this museum’s enormity as I thought it was supposed to be “not as big as one would hope.” Needless to say, it was plenty big for me. Once I’d made my way to the outside Noble Energy Science Park I found several interesting items. One was a retired Israeli Air Force F-21 Kfir warplane, another was a helicopter-like creation that requires pedaling and pumping to “take flight.” I was a tad too large to comfortably pedal – my knees were trying to crush my rib-cage. 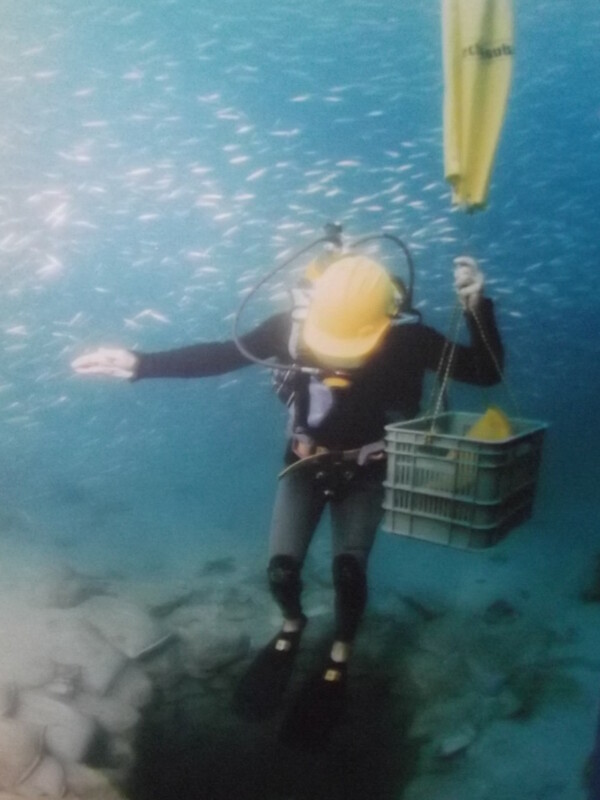 But shortly I was assisted by a worker of the museum who showed me his “flying” skills and then led me to the next activity. This one was called the Boyo – a human yo-yo – and he showed me how to hold on, pull while dropping to one knee, stand up and let the recoil of the rope pull one up. I attempted to reach the 4 metre (13 feet) launch but I wasn’t experienced and I landed on an angle, losing the necessary force to reach the top. I tried over and over and he tried helping me but my arms got kinda sore so I gave up. The museum guy also took me to another of Madatech’s features, the Sports Science building with all sorts of energy-sapping activities to be experienced. There I karate-chopped a foam block measuring the speed of my chop. I got 90-something kilometres per hour but I’m guessing I could have gotten more but my arms were a tad sore from the Boyo bouncing. I also raced wheelchairs but the empty seat beside me put no effort into the race so I stopped racing and relaxed instead. When I was done in the Sports Science building I realised that I was at Madatech for nearly 3 hours and wondered why there wasn’t anywhere to nap… After leaving I meandered around the area, dropped some change into a street musician’s case as he broke out into a oldies (1920s-40s) tune – putting a skip in my step, and then boarded a bus to the Cinemall where I got a falafel and a train to Nahariya. At Nahariya I hopped on a bus and arrived home. To Haifa again next time, or elsewhere? On Monday I went to Haifa again. The reason I have been frequenting Haifa is for this nifty little gig I got writing for Tourist Israel, and Haifa is being covered by myself. I still have future trips planned for that large coastal city so be prepared to know a lot about Haifa. Once I had alighted from the train at the Mercaz HaShmona station next to the Port of Haifa I walked several blocks until I reached the German Colony of Haifa. 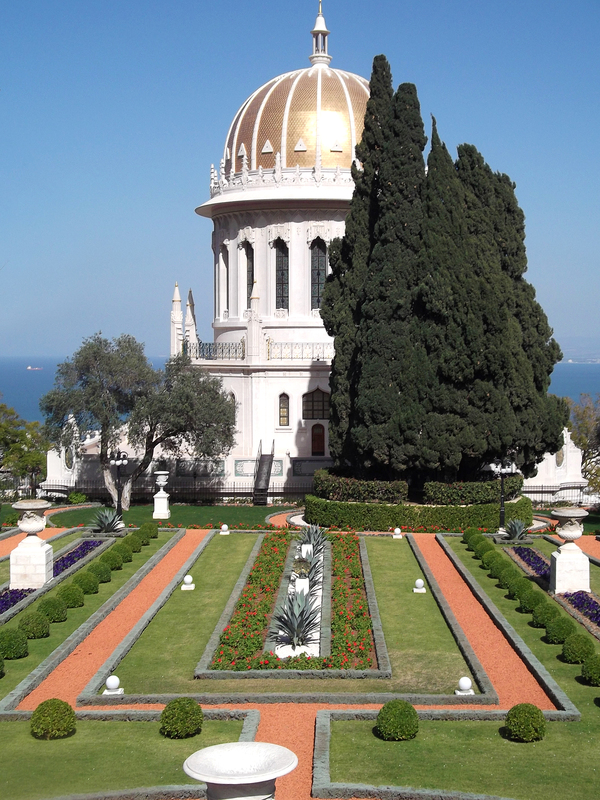 The German Colony is a small area nestled between the Baha’i Gardens and the Port of Haifa. It was built up in the late 1860s by German Templars – not the Templar Knights who ruled Castles Monfort and Yehiam back in the times of the Crusaders. 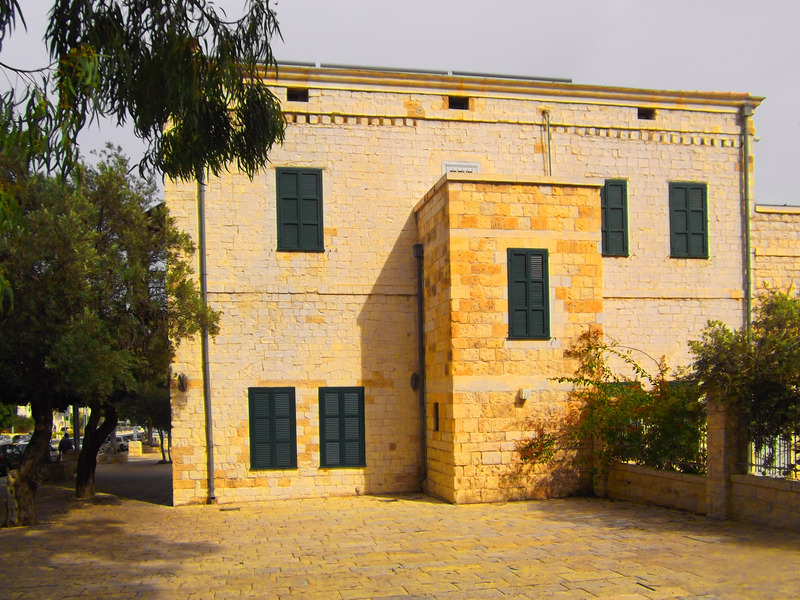 One of the old buildings, this one the historic Templar Community House built back in 1869, now houses the City Museum of Haifa. Within the walls of the recently restored building I found interesting content – not what I had initially expected for a City Museum. 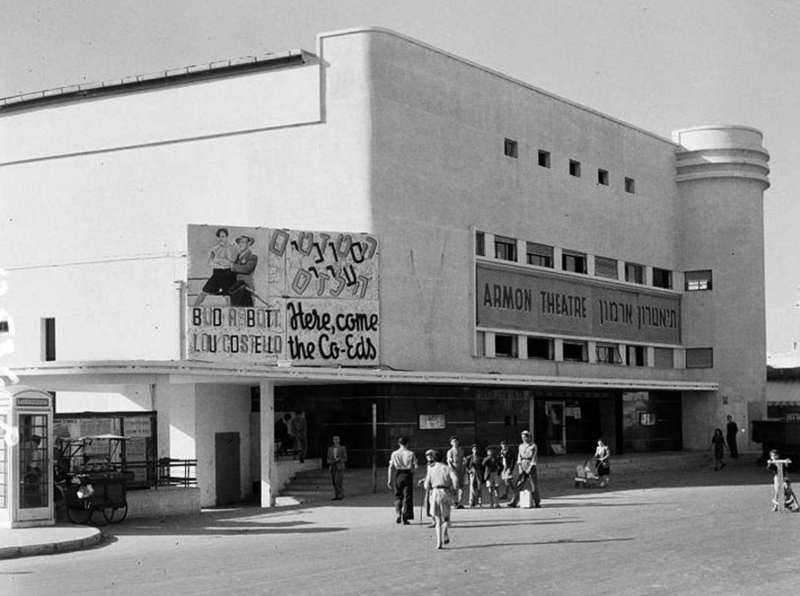 This museum was filled with everything of Haifa’s cinematic past, from old film reels to ticket stubs to blueprints of Haifa’s early movie-houses. I am a bit of a cinemaphile so I found it fascinating to see what played at the Armon Theatre’s opening night (The Merry Widow, an Oscar-winning musical comedy from 1934). I enjoyed examining the old tickets, seeing how the currencies changed over the years to what we know now as the New Israeli Shekel. Sitting in the small mock-up theatre watching old Israeli movie commercials and trailers from old classics brought me back in time to the Golden Age of the Silver Screen. After I had thoroughly browsed all the old letters, showtimes, invitations and pictures I bid farewell to the museum’s receptionist, gathered up my papers and headed outside. Next stop walking up the German Colony was meant to be the Baha’i Gardens but when I asked a pair of American pilgrims they showed me that public visiting hours were only until noon and I had spent too long in the City Museum. So, I stopped into the Haifa Tourist Board office and asked for bus directions to the Clandestine Immigration and Navy Museum, found directly below Elijah’s Cave (as previously mentioned in my first “Haifa” post). I got directions, hopped on a bus and made my way to the museum. Now, I have already been to the Clandestine Immigration and Navy Museum but it was still a treat going again. 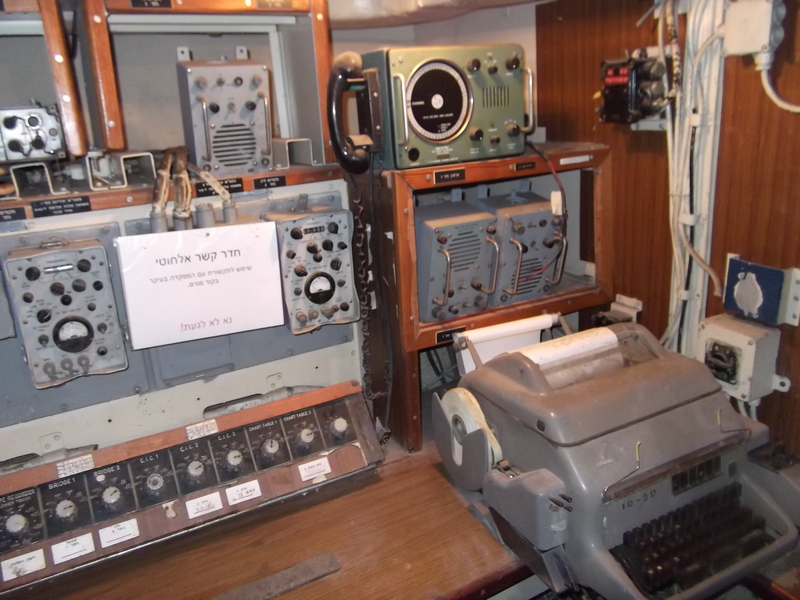 Easily my favourite Israeli museum as of yet, the Clandestine Immigration and Navy Museum has fascinating exhibits both hands-on and the traditional artifacts-in-a-glass-case kind. When I got to the museum the tinted glass door was locked. I was dismayed as it was clearly opening hours and I could think of no reason why they should be closed. As I was about to turn away in frustration I heard a key in the door and two guards emerged. One asked me for ID and I handed over my Teudat Zehut (Israeli ID card). He examined it and looked under the card suspiciously so I asked him why the heightened security. He answered that it was coming from the Ministry of Defence and yes, his uniform said “Ministry of Defence” on it. I thought it was strange as the Navy runs the museum, can’t they find some able-bodied seamen to guard the museum door? The guards let me in and I paid my admission fee. I stowed my coat and extra stuff in the designated spot and found the used book stack, books mostly revolving around military offered for sale to visitors. The first book I picked up surprisingly was exactly the type of book I like; Israeli forces in their constant struggle for peace in this wartorn region of the Middle East. Not only was this book, Israel vs. Jibril, the ideal book for me, it was also signed by the author, Samuel M. Katz, as a personalised gift to retired Major-General Ami Ayalon (previous head of the Shin Bet and the Israeli Navy). I quickly gave the book to the soldier behind the desk, even though nobody was likely to buy it in my absence, and continued into the museum. After reading about all the fascinating war heroes of the Israeli Navy, including the Squadron 788 and their patrols of the Kinneret under Syrian MiG fighter jet and artillery fire was almost too much to bear at once. I reckon I could spend several days in the “History of the Navy” exhibit. 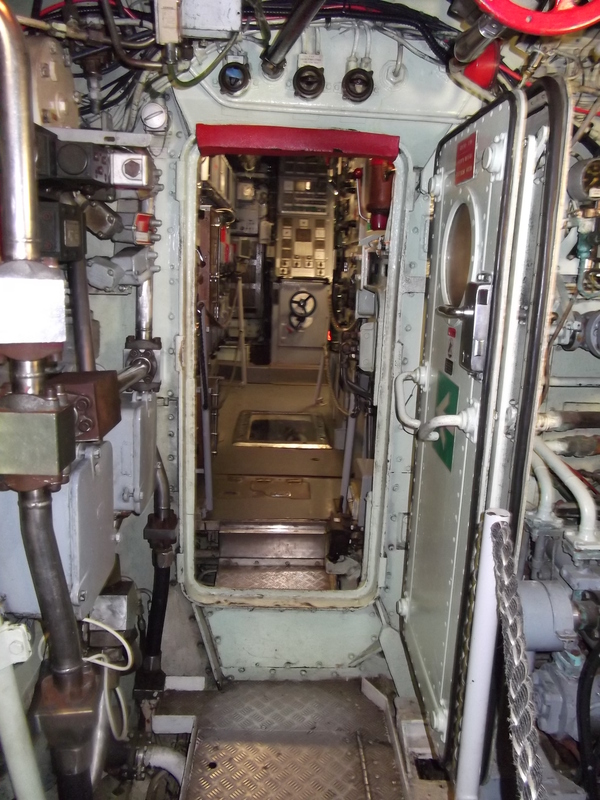 Outside, there are dozens of naval guns, missiles, torpedoes, old ship parts and several intact boats, ships and submarines. Available for internal exploration are the INS Mivtach missile boat, the INS Gal submarine and the “Af Al Pi Chen” immigration ship. The Navy did an outstanding job on the recreation of maritime feel with commands and authentic noises found on such vessels. 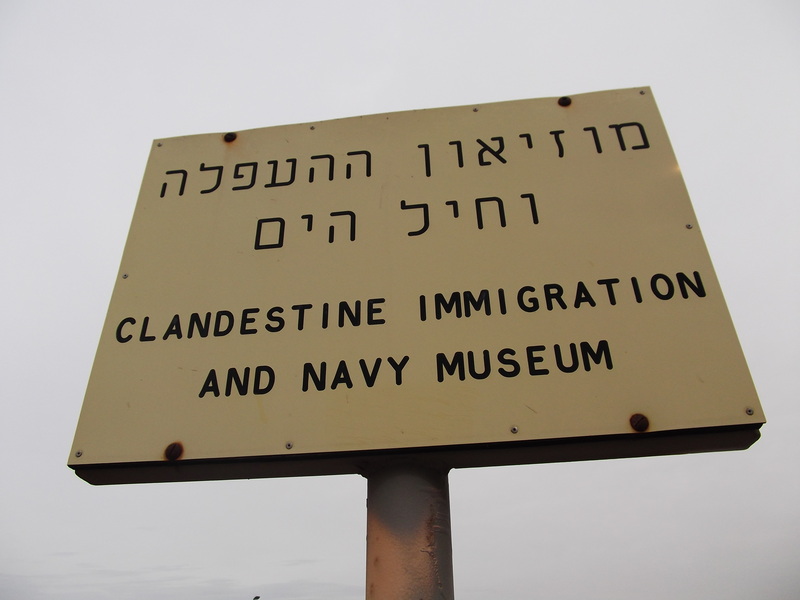 I must say, if one lives in Israel (or is coming to visit), and one has not yet been to the Clandestine Immigration and Navy Museum, it is well worth it. 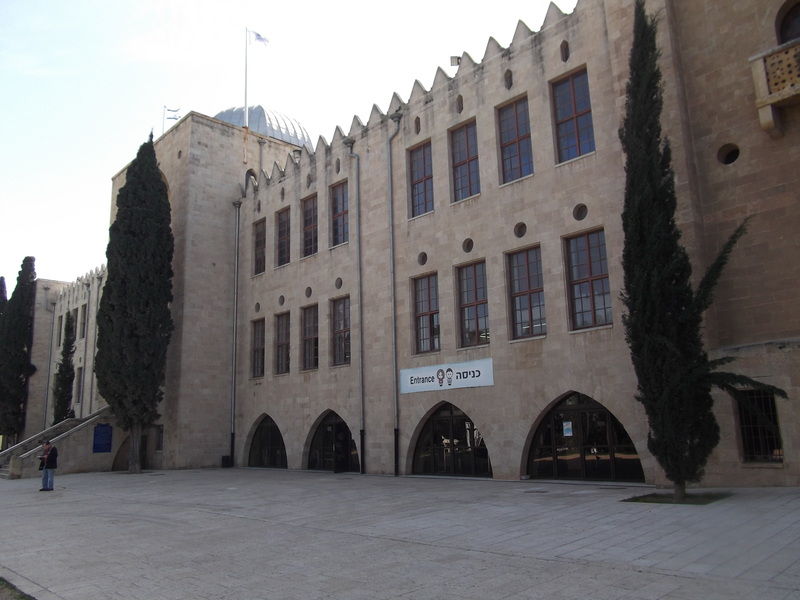 I am reluctant to reveal all of the many unique features of this museum as I truly believe everybody should visit it at least once, to better understand the miracles we experienced as a people in the last 60-something years here in the Land of Israel. After the museum, some 2 hours after I was admitted, I walked to a bus stop and boarded a bus in the direction of Hof HaCarmel, the beaches of Haifa. Monday was a very windy day but there were no waves, oddly enough. When I had navigated the maze of underground tunnels and passages, I made my way to the beach and nimbly jumped my way to the far end of the rocky pier outcropping jutting out into the Mediterranean Sea. 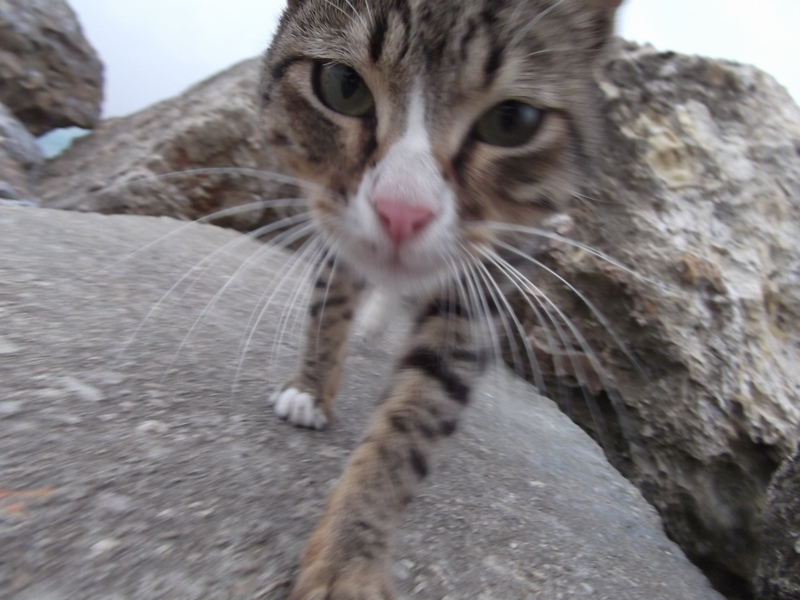 Also on the pier was an overly-friendly cat that was very eager to befriend me, trying to cull some food out of me as his end-game. 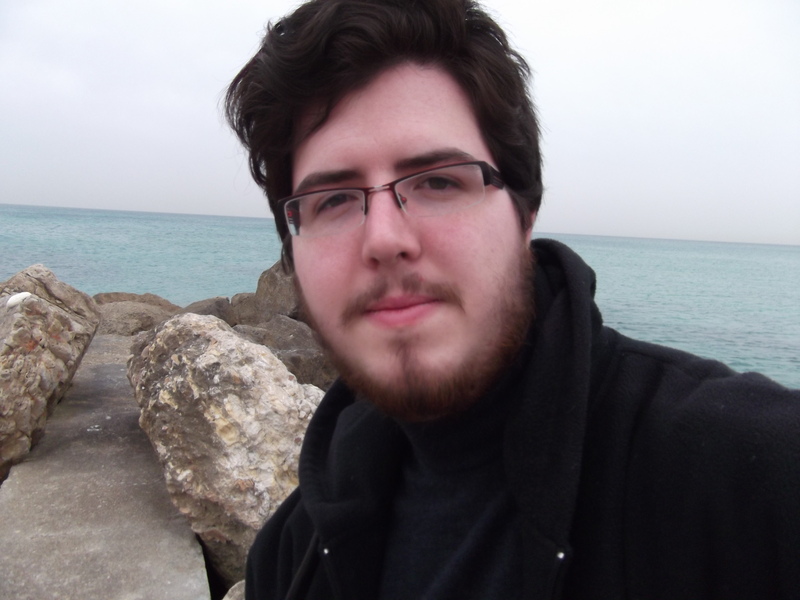 Yesterday I went to Haifa and I had one of the best times yet in that large coastal city! At first I stopped off at Kiryat Motzkin to interview someone for an article I am working on but before long I was back on the train headed for Downtown Haifa. When I got off the train at Mercaz HaShmona I had to walk swiftly through the light yet very cold rain to get to Paris Square, the lowest stop of the Carmelit Underground Train. When I set eyes on the little subway I immediately loved it. 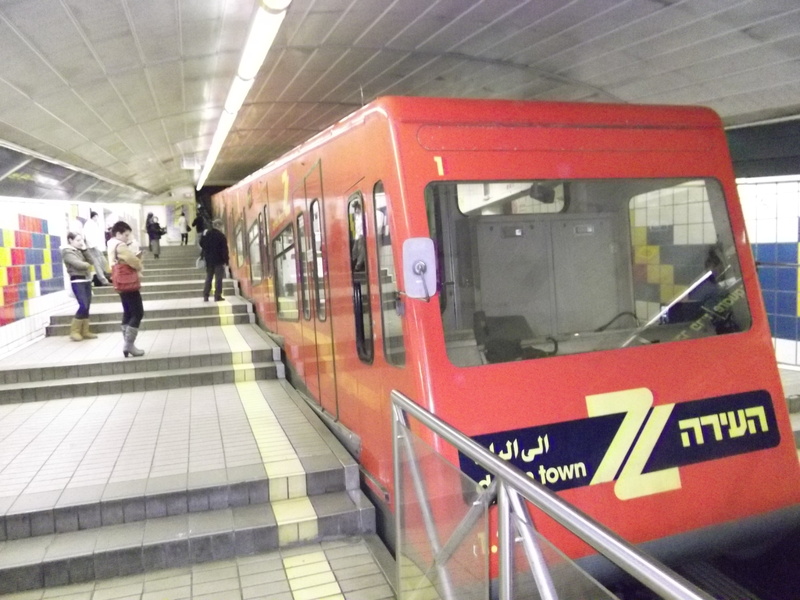 For me it felt like an amusement ride, going up the mountain in a snug tunnel sitting in a retro-looking train car with luridly painted tiles decorating each stop. No expert on subways, this may have been the first time I have ridden one, I delighted myself watching the stone walls of the tunnel whip by mere inches from the window. At one point I got a little queasy as I was watching the wall but looking downward. When the tiled floor of the next stop came rushing up at me a wave of confused nausea swept through me and made me look away. As I looked away I remembered my wonderful time in Orlando, FL, at the Universal Studios Amusement Park. 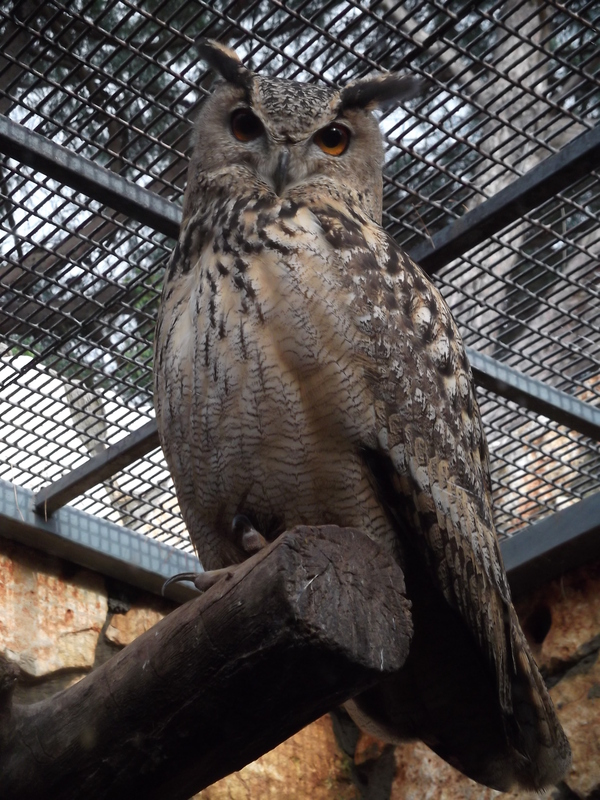 Eight minutes after the tiny train left Paris Square we reached the end of our ride and I rode up the escalator to find myself in earshot of my next destination – the focal point of the day, the Haifa Educational Zoo. I purchased my ticket and entered the world of exotic animals, the joyous laughter of the security guard trying his broken English on me mixing in with the noises of the animal kingdom. It was a slow day at the zoo, winter and rain attributing to that, and I was mostly alone as I peered at the animals in their habitats. I felt like a little child, ooh-ing and aah-ing at the animals. I was fascinated at the immense size of the sleeping Bengal tiger and wished that the Nile crocodile would move some instead of dozing in the water. At one point I heard someone singing and when I got closer, and into view, I saw a zookeeper singing softly to a huge white cockatoo. The bird loved it but the man stopped when he say me and told the bird to go ahead and dance. The bird followed the man’s instructions and danced gaily on the trees inside his enclosure. Other birds didn’t seem as friendly – one large eagle owl stood still and watched me walk by, his wise head turning slowly to a point where most chiropractors would have fainted away. One part I really enjoyed was the lemurs. I had just examined the capuchin monkeys as they leaped around and was surprised to see the lemurs adopting a sunning position. They broke away from the huddled line that kept them warm in the chilly winter breeze and began to sit with their arms spread out. Then they each did something amazing. Each one turned his head to make sure he was not blocking another lemur’s sun-rays. It was fascinating. 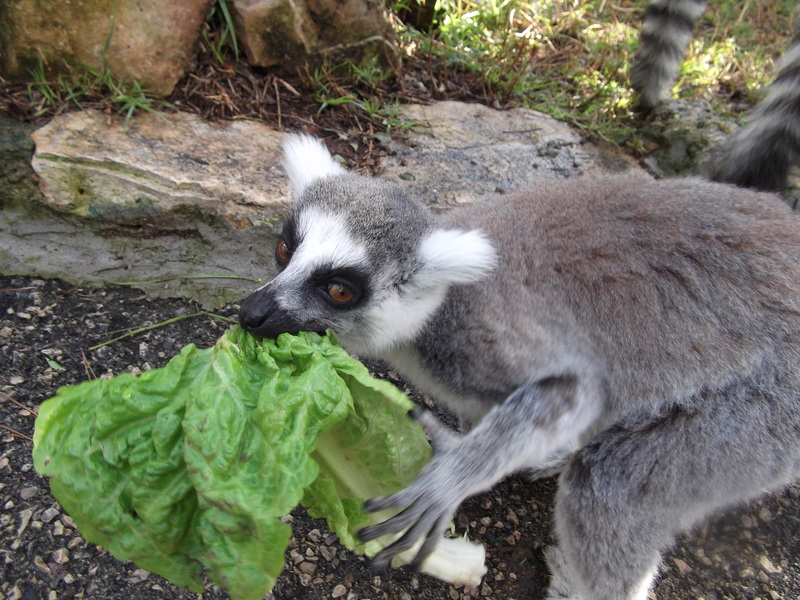 Several minutes later I bumped into two zookeepers who were heading to the lemurs to feed them. I asked if I was allowed in and they agreed, even though the official lemur visiting hours were already over. At the gate one of them said that I was a rabbi and I told them that no, I am not a rabbi. That was interesting. Once inside, among the chipper little lemurs, I asked them if they liked there job and they said that even though they spent 90% of the time cleaning, this was the best job in the world. They looked like they meant it. After the lemur feeding I continued alone along the path. 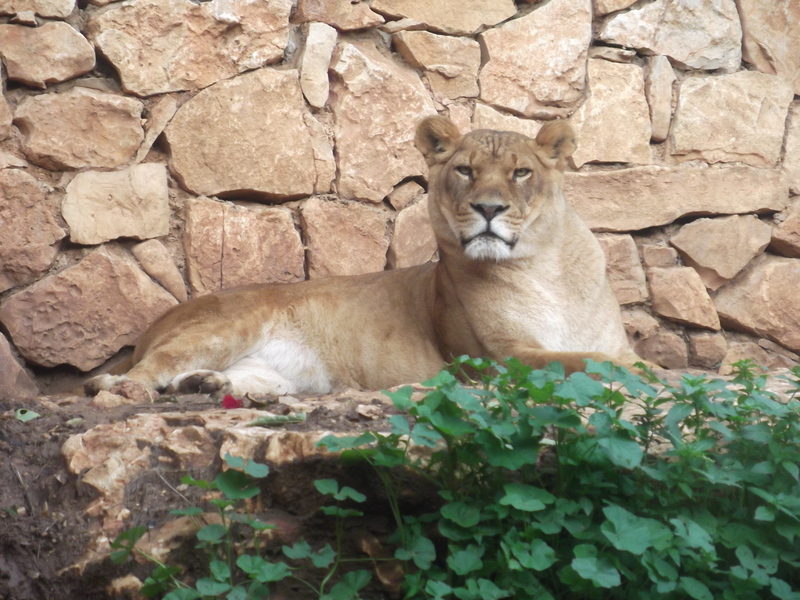 I was amazed to watch the lions eat – they had some huge leg bone or something – especially when I heard a bone crack. The male lion looked shabbier than the two female lionesses but after four weeks of rain and mud – this January being Israel’s rainiest recorded month, who can blame him. It made me laugh because to me he looked like a sad clown with his black lips and his eyes all muddy. After the lions came a huge Syrian brown bear in a huge enclosure but he was feeling sluggish so I kept going. 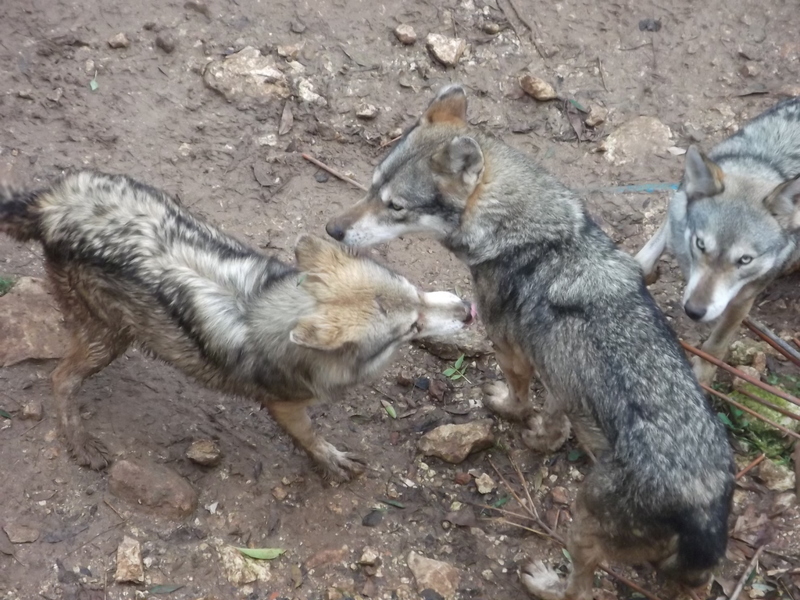 The wolves, Israeli wolves also known as Arabian wolves, were having a good time howling and playing with one another. Along with the wolves there were numerous foxes and other animals found locally in Israel such as camels, ibexes, wild boars, caracals, porcupines, jackals and the rare Persian fallow deer which I saw once during a hike in Nachal Kziv. Also found in Israel, the Griffon vulture, a huge bird that some people may recognise from The Jungle Book movie. Towards the end of the path, after the reptile building which I will explain shortly, there was a humorous sight. In one habitat there were dwarf mongooses and a large desert tortoise. The mongooses sat on top of the tortoise and even took their food up, sitting on the tortoise and using its shell as a table/chair combo. It was cute. 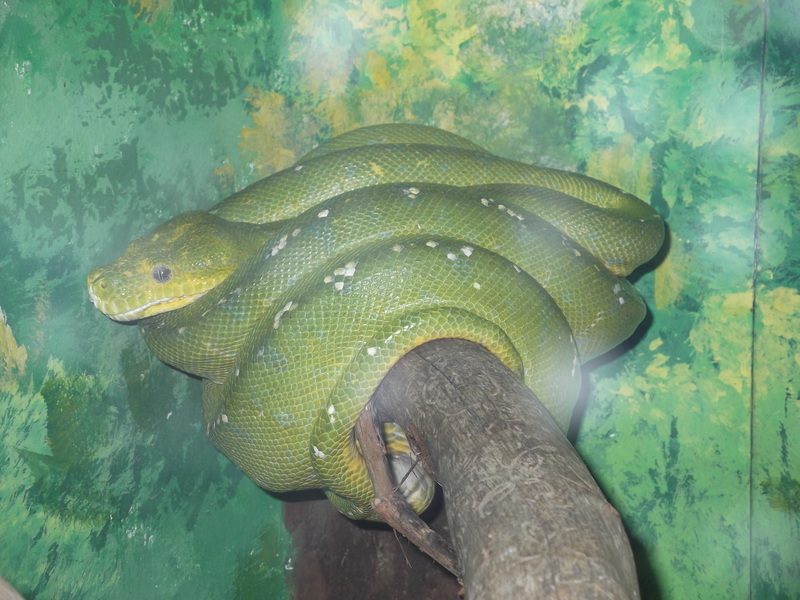 Now, the reptile building, a climate controlled structure with places for lizards and snakes including pythons, vipers, boas, anacondas and a Nile monitor lizard. I was surprised at how big the anacondas were even though the ones in the zoo were far smaller than the behemoths that exist out there. As I looked down I was tracing a small dark object far below as it made its way around the little seawall and into the port. The wake was odd and I know the Israeli Navy’s submarines are docked in Haifa port so I think it may have been one of Israel’s Dolphin submarines. If it was, cool, if not, it was still cool. If I would have had a telescope or a pair of binoculars it would have been better but I think that the view from the Louis Promenade is the best I have seen in all of Israel. So here’s to Israel, the loveliest place in the world!